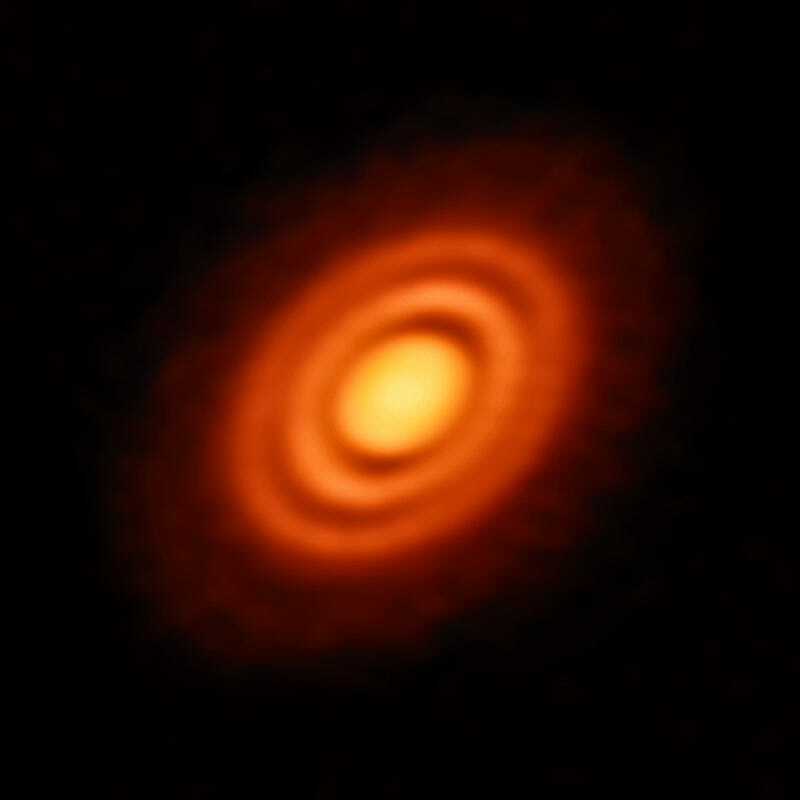 Using the Atacama Large Millimetre/submillimetre Array (ALMA) in Chile, two teams of astronomers have detected three infant planets around HD 163296, a young star located about 330 light-years from Earth. This star is twice the size of our own Sun, but at four million years old, it’s a mere one-thousandth the Sun’s age. To detect the new planets, the astronomers used a new technique that detects anomalous patterns of flowing gas within planet-forming disks. 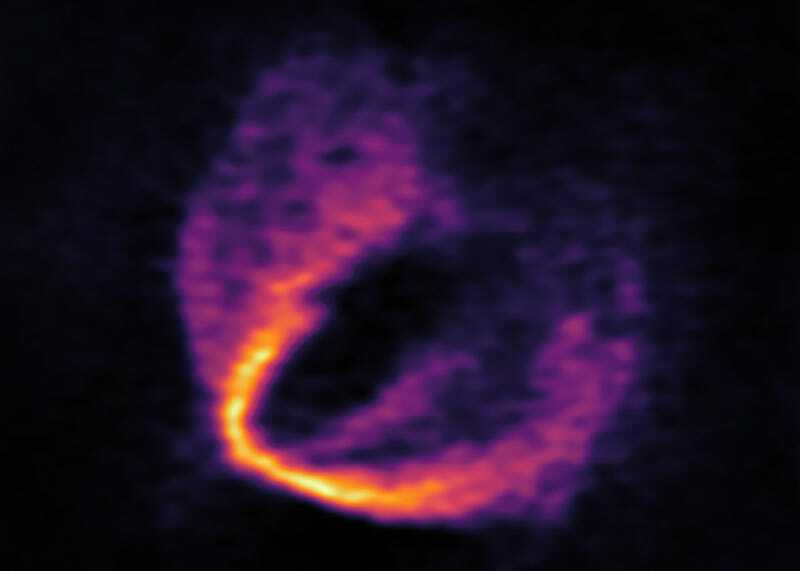 ALMA has been used before to study protoplanetary disks, but this time around the telescope was used to take a much closer look, specifically at the way carbon monoxide (CO) gas flows within this planet-forming region. Carbon monoxide molecules give off a distinctive millimetre-wavelength light signature, which ALMA is able to detect. Astronomers use the Doppler shift to see how this gas moves within the disk. All things being equal—at least from a gravitational perspective—the gas should flow in a steady, predictable pattern. But that’s not what the astronomers saw. At three specific regions within the protoplanetary disk, the gas makes dramatic movements in the form of shifting carbon monoxide wavelengths. These movements, the astronomers argue, are being caused by massive objects, which they interpret to be the three protoplanets. The effect can be compared to the way water eddies form in a river around large rocks. Previous studies (also using ALMA) highlighted the presence of large gaps within protoplanetary disks. These gaps, it was theorised, were caused by forming planets. That may very well be the case, but the evidence was circumstantial at best, and the data used in these studies couldn’t be used to estimate the size of the suspected planets. The new technique can do exactly that, while providing a superior way of peering inside these planet-forming disks to see what’s actually going on inside.